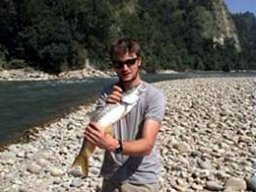 Fishing in the Himalayas is an activity you should try at least once. A Himilayan fishing expedition allows you to not only experience the joys of fishing but also the opportunity to do so in stunning landscape, amongst Himilayan bird life and other wild animal, like rhino and tiger, that often come to the river to take a bath and to quench their thirst. For fishing trips of more than one day we setup camp (tents) near the river. 'Camping out' definitely adds to the adventure element of the experience. 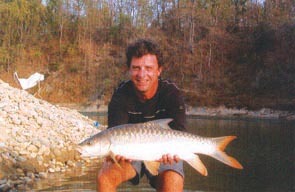 I have been organising fishing trips to three of the major Himalayan rivers (Karnali River, Babai, and Bheri) since 1999. 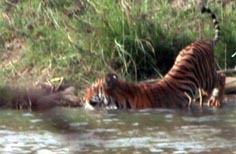 I am also able to organize fishing trips to other rivers such as the Sunkoshi, Arun or Tamur on request. There are 118 varieties fresh water fish in the Himalayan Rivers ranging from much sought after Mahseer to the mountain stream trout-like varieties and salmon. You'll need to allow at least two days on top of any 'fishing days' for the journey to the Rivers and back from Kathmandu. If you are going to India afterwards then you need to only allow one day. Any booking requires a minimum of 2 persons. *Cost includes Food, accommodation, gillie, permit, fishing equipment, and transportation.